CABLE TROUGH are manufactured using high strength polymer concrete material. Cable Trough provide Railroad, Mass Transit and Power Plants with durable and cost effective enclosures for cable and fiber optic cables. Install in areas subject to occasional heavy vehicular traffic. The heavy-duty design of the trough and cover assembly can withstand sidewall pressure due to heavy vehicular traffic. Cable Trough can be supplied with optional dividers to segregate electric and telecommunications cables. They are connected with interlocking bolts and can be field cut to modify and adapt to different field conditions. Polymer concrete is not affected by chemicals, quick freezes or thaws and does not conduct electricity, no grounding is necessary. Cable Trough is lightweight and the interlocking system makes installation quick and simple. Does not require heavy duty equipment. CABINET PAD OPENINGS will accommodate most cabinet makes and models. Troat insert locations and sizes can be tailored to meet customer’s requirements. WATER SAMPLING STATIONS are manufactured from low density polyethylene material with UV inhibitors for commercial or residential settings. Easy access, safe sampling and non-corrosive. They are maintenance free, graffiti resistant, sturdy, lightweight, high impact resistance with outstanding weatherability. Aesthetically pleasing finishes include Sandstone and Granite, additional colors are available. Options include Sampling Bibb, Directional Flow Flush Valve. 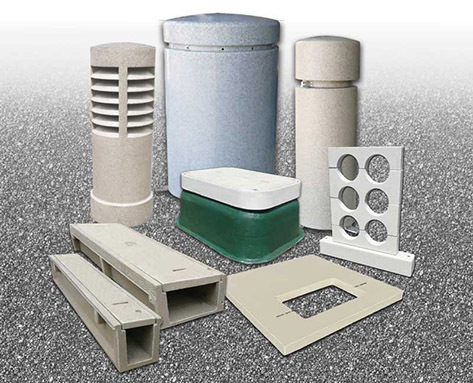 STAND PIPE VENTS are manufactured from low density polyethylene material with UV inhibitors for commercial settings. They are maintenance free, graffiti resistant, sturdy, lightweight, high impact resistance with outstanding weatherability. Aesthetically pleasing finishes include Sandstone and Granite, and Dark Green, additional colors are available. AIR VACUUM VALVE ENCLOSURES are manufactured from low density polyethylene material with UV inhibitors for commercial settings. They are maintenance free, graffiti resistant, sturdy, lightweight, high impact resistance with outstanding weatherability. Mounting frame is designed for easy removal to facilitate entry to those particular valves that may require frequent access. Aesthetically pleasing finishes include Sandstone and Granite, and Dark Green, additional colors are available. Call ARMORCAST PRODUCTS COMPANY for more details and information on all of our Specialy Products..